Why Does Iron Man Recruit Spider-Man Instead of Daredevil in Civil War? The Marvel Cinematic Universe is expanding at an exponential rate, with Captain America: Civil War kicking off Phase 3 in theaters this past weekend. The MCU has been growing on the small screen as well, with ABC's Agents of S.H.I.E.L.D. and Agent Carter, along with the hit Netflix shows Daredevil and Jessica Jones, with Luke Cage and Iron Fist also coming soon. 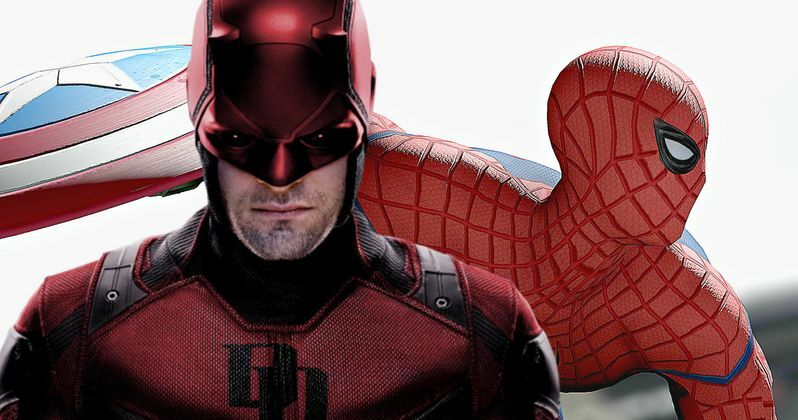 Captain America: Civil War introduced fans to the MCU's version of Spider-Man, played by Tom Holland, but this introduction has some wondering why we didn't get to see other New York based heroes, like Daredevil. There will be SPOILERS for Captain America: Civil War below, so read on at your own risk if you haven't seen the movie quite yet. We first meet Tom Holland's Spider-Man about halfway through Captain America: Civil War, when Tony Stark (Robert Downey Jr.) makes a surprise visit to Peter Parker's home, recruiting him to join Team Iron Man. During a new interview with IGN, Captain America: Civil War writers Christopher Markus and Stephen McFeely were asked why Tony Stark didn't reach out to Daredevil, who is a part of the MCU but hasn't been seen in any of the movies yet. Here's what Christopher Markus had to say below. Early on in Captain America: Civil War, after Tony Stark's MIT speech, he meets a mother (Alfre Woodard) who blames Tony Stark for the death of her son, who was in Sokovia during the disaster that unfolded in Avengers: Age of Ultron, which is part of his motivation for putting the Avengers "in check." The choice to recruit a young kid like Spider-Man could be seen as a way to make amends for that mother's loss, but Stephen McFeely reveals there is another reason why Spidey was recruited. We'll next see Peter Parker in Spider-Man: Homecoming, which Robert Downey Jr. recently signed on for, to reprise his role as Tony Stark/Iron Man. No plot details have been uncovered quite yet, but we know that Marvel plans on ditching the well-worn origin story, with Peter Parker already established as Spider-Man. Spider-Man: Homecoming, which will be directed by Jon Watts from a script by John Francis Daley and Jonathan M. Goldstein, will hit theaters on July 7, 2017, but it isn't known when production will begin.